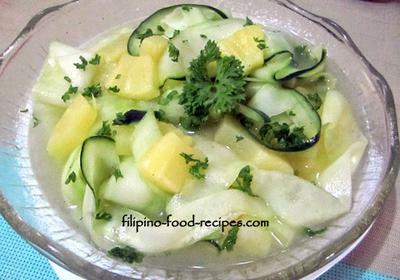 Cucumber pineapple salad is a simple refreshing side dish to whet your appetite. It is the usual Pipino (cucumber) Salad with pineapple and some greens, that you could serve at parties and gathering. The sweet pineapple addition cuts the tartness of the vinegar, and if you cut the cucumber thinly along its length with a peeler without removing all of the skin, you will have a fancy looking salad worth serving at special occasions. Try it and you will surely love it. 1 can Pineapple tidbits 227 gms. 1. Peel part of the cucumber, leaving some of the green peel intact. 2. Using a peeler, cut the cucumber along its length getting some of the skin in every slices. 3. Add all the other ingredients including the juice from the canned pineapple. 4. Mix together, top with parsley and refrigerate.